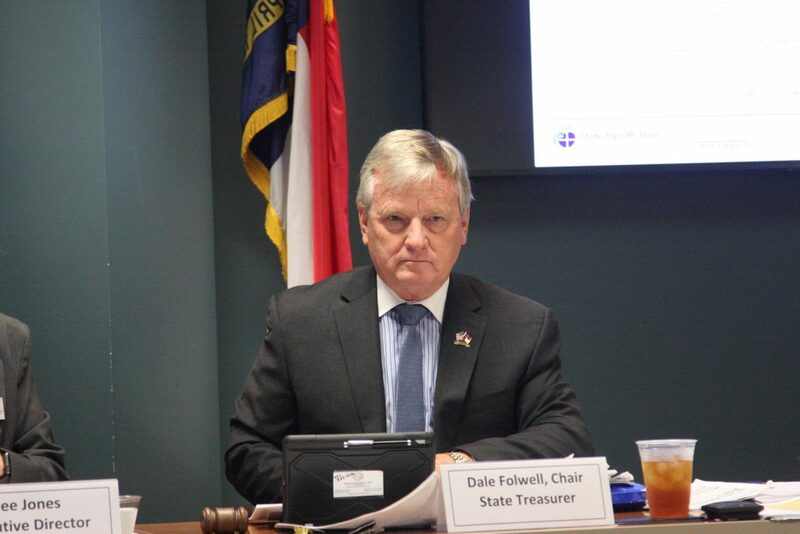 State Treasurer Dale Folwell’s proposed cost-cutting reforms for the State Health Plan have drawn praise from state employees’ representatives and a nationally recognized free-market health finance expert. But medical providers aren’t too happy with the treasurer’s plans. The State Health Plan has a $3.3 billion annual budget, though costs exceed state appropriations. It is only 3 percent funded, with $35 billion in unfunded liabilities. A fix remains elusive. Josh Archambault, senior fellow at the Florida-based Foundation for Government Accountability, said the North Carolina system covering 720,000 state employees, dependents, and retirees needs a fresh approach. Folwell and representatives of the state’s largest health care provider organizations didn’t see eye to eye when they met Oct. 29 to discuss the treasurer’s plans. Folwell announced the State Health Plan would transition from a commercial-based program to a reference-based government pricing model which indexes provider payments to Medicare rates. Providers insisted Folwell’s plan threatened the survival of struggling rural hospitals, and could force State Health Plan members to travel longer distances for health care. They said many of the treasurer’s complaints about lack of transparency had to do with Blue Cross and Blue Shield of North Carolina, which administers the self-insurance plan, not with doctors and hospitals. Folwell said providers share the blame for ever-rising health care expenses by fighting competitive practices and avoiding transparency. Hospital consolidation increases costs and lowers access, he said. Hospitals hide cost schedules from consumers, and don’t disclose treatment outcomes that would let State Health Plan members make wise choices. He raised the prospect of provider collusion, sparking tense debate with Steve Lawler, president of the N.C. Healthcare Association, representing hospitals and health care systems. Folwell said BCBSNC and UNC Health Care refuse to give the state billing data to determine what the health plan is paying for, and whether charges are legitimate. Blue Cross says the state plan is bundled with other clients and revealing the information would expose trade secrets. Adopting a reference-based system specifically for the State Health Plan would boost disclosure. “You have been a part of working really hard to create this broken system. You have been a part of that for a long, long time,” Folwell told the provider representatives. At one point he threatened to end the meeting if they insisted on shifting the conversation away from reference-based pricing. N.C. Healthcare Association Vice President Cody Hand criticized Folwell for giving the organizations too little time to work together on a better plan. Hand said Folwell’s had two budget cycles to work with the General Assembly on solutions. Folwell said he inherited the bad situation, and Hand wants taxpayers to pick up providers’ high costs. He cited several times the legislature has tried but failed to corral health care costs. State Health Plan officials criticized Lawler and N.C. Medical Society CEO Robert Seligson for not participating in a July 18 stakeholders meeting or recommending price-cutting reforms. “I can tell you it’s going to result in less revenue to your clients,” Folwell said of the new model. Hospitals and physicians have long assumed state money would always be there for them, said State Health Plan Executive Director Dee Jones. “Somewhere along the line fiscal responsibility went out the window,” she said, noting N.C. Medical Society President-elect Timothy Reeder told stakeholders at the July meeting there was at least 15 percent waste in the system. “I would say that I’ve never seen an initiative where cutting your way to better health for individuals is a successful strategy,” Lawler said. “It is our belief and estimate that this plan will economically harm hospitals and health systems, especially those in small communities, as well as physicians,” Lawler said. It will reduce care because people will either shut down services or reduce staff, particularly in rural areas. The plan would take away $300 million to $500 million from providers. “I am glad to hear somebody [admit] the health plan has been subsidizing rural health care [at the expense of plan members],” said Ardis Watkins, spokeswoman for the State Employees Association of North Carolina. SEANC has contended for almost 20 years the plan was propping up rural health systems. SEANC supports reference-based pricing. “We can’t point fingers at each other,” Seligson said. “We’re all going to have to give something to make it better,” and his group wants to collaborate. Lawler blamed high health care costs in large part on inadequate Medicare and Medicaid payments. Yet he said expanding the state’s Medicaid program is part of the solution. Andrew Norton, State Health Plan deputy general counsel, said the State Health Plan now pays 126 percent of the Medicare rate for professional services. That would increase to 160 percent. Inpatient, outpatient, critical access inpatient, and critical access outpatient rates all would be higher than Medicare rates, in some cases more than double. Those rates closely match what the provider organizations already negotiated with the N.C. Industrial Commission, he said. Montana and California use reference-based pricing. Archambault said they offer health plan members cash incentives to reduce costs. That nudges them to shop for best prices and outcomes, encouraging innovators to compete for the large volume of plan members. Archambault said robust competition should drive down prices, so the state could decrease reimbursement rates, saving even more money over time.